Will managed amenities for office buildings turn dead public spaces into revenue generating, efficient and usable ones? This article first appeared in Term Sheet, Fortune’s newsletter on deals and dealmakers. Founded in 2009, Convene hopes to become to office space what hotel flags are to hospitality. “We are helping landlords run an office building like a full-service lifestyle hotel,” co-founder Ryan Simonetti told Fortune. “It’s the Starwood-ification of real estate. Increasingly, venture investors view real estate as the next industry to be transformed by disruptive technology. But as they start investing in the category, they might find that traditional real estate investors, including Brookfield Property Partners, one of the country’s largest landlords, are already ahead of them. Convene, a New York City-based startup, is Brookfield’s only startup investment, and today Brookfield has doubled down on the bet. Brookfield led a $68 million Series C investment in the company alongside Conversion Venture Capital and ArrowMark Partners, the companies tell Fortune. The Durst Organization and Elysium Capital Management also participated. 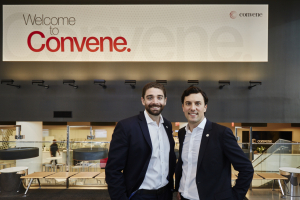 Convene previously raised $45 million in funding. Brookfield is “eager to explore working with and investing in” exiting startups, a company spokesperson said. Essentially, Convene manages the managed amenities of an office building, like the food, the conference rooms, event spaces, the gym. It currently offers 12 “branded” retail locations in three U.S. cities. In addition, the company offers a “managed amenities” package to landlords, where the company handles the service part of all those managed amenities. Notably, Convene offers these services on behalf of the landlords, not the tenants. Tenants are increasingly asking for these things when they move in, Simonetti says, and landlords are willing to pay for them. It has opened two of those so far in New York City. Simonetti was previously an investor at Lehman Brothers, where he focused on office buildings and hotels. Amid the financial crisis, he realized landlords weren’t paying attention to the needs of their customers. They weren’t providing “amenity-rich experiences” the same way boutique hotels and luxury condo developers were starting to, he says. Convene is capitalizing on that trend. Further, employees’ ability to work from anywhere at any time has merged personal and professional into what Simonetti calls “work-life integration.” Beyond that, companies are now using fancy offices as a way to attract talent, rather than as a balance sheet liability. Convene, which has 262 employees, has grown profitably since it was founded in 2009. It took the company some time to get to a place where it is ready to grow quickly, but now, Convene is poised to grow exponentially, Simonetti says. “We feel comfortable dramatically accelerating the speed at which we scale,” he says. In the next year, the company will more than double the number of managed locations to 30. Convene’s managed amenities business does not feel much like a tech startup business model, but Simonetti says the next phase includes a software product that will “digitize” the buildings Convene is in, allowing employees to do everything from going through security and booking a conference room to booking a class and sending feedback about the temperature, all within one app. Technology’s role in the buildings is to reduce friction, Simonetti says. “We think the massive shift toward managed amenities and flexible space is something landlords have to respond to,” he says.